Colored pencils feature a special lead formula that erases effortlessly. Rendered lines erase clean with few strokes of the eraser. Pencils sharpen to a needle point and stay sharper longer. Ideal for illustration, animation and accounting applications. PMA certified nontoxic, strong, thin lead resists breakage. 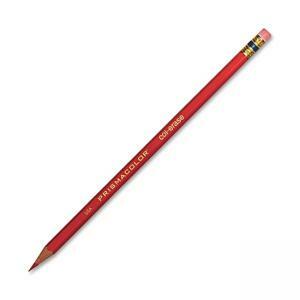 Pencil design includes a metal ferrule with twin band and red eraser.